... like that Medium article you sent me, where the author quotes Umberto Eco talking about blue jeans. Some guy left a really lengthy comment on that article. He said that the author was wrong, that clothing is actually completely unimportant. He bought a sports car while wearing a hoodie, and he only works at places that have a casual dress code. So, he’s restricted his job options based on what he wants to wear, but he still thinks clothing doesn’t matter. The only way you can show that you don't care about clothing is by the clothing you wear. Joanne Eicher's CV is 50 pages long. The "Education" section is fairly brief. It lists three post-secondary degrees, all received from Michigan State University: a B.A. in 1952 with a minor in Textiles, Clothing, and Related Arts; a master's in 1956; and a Ph.D. in 1959, awarded for Joanne's research on the lack of out-migration among Finnish communities in Michigan's Upper Peninsula. The Dartmouth Medal from the American Library Association, awarded for Joanne's work as editor-in-chief of the "Encyclopedia of World Dress and Fashion," which debuted as a 10-volume print work in 2010 before going online, where it continues to expand. I've pulled these selections from more than 30 career citations listed on Joanne's CV. Much of the acclaim came towards the end of her career or even during retirement, by which point she had published 20 books as editor and author, contributed 40-plus chapters in academic anthologies, and placed more than 50 articles with scholarly journals. Her credits for editing will only increase as she continues to oversee two book series from Bloomsbury Publishing, both of which Joanne helped launched: "Dress, Body, Culture" and "Dress and Fashion Research." As for the "Encyclopedia," which Joanne considers a fitting capstone to her career, she continues to commission 100,000 words per year for online entries. Joanne's achievements set precedents. She co-edited the first anthology on the socio-cultural and aesthetic significance of dress ("Dress, Adornment, and the Social Order") in 1965. She co-authored the first academic text on cross-cultural dress ("The Visible Self") in 1973. Currently, an academic named Gloria Williams is writing an intellectual biography on Joanne. Dr. Williams contends that Joanne was not only the first person in the United States to teach a course on African dress―which Joanne indeed was, in 1967―but that Joanne is also the first American to discuss African dress as a form of art. As Dr. Williams continues her research, it's altogether possible that Joanne will continue to break new ground for work she did decades ago. One precendent stands out for me: Joanne literally changed the meaning of dress. The "classification system of dress" that she and Mary Ellen Roach-Higgins debuted in the second edition of "The Visible Self" offered a new conception of how we dress our bodies. Ultimately, Joanne moved discussions about clothing and style from What (talking about clothing as clothing) to Why (talking about clothing as identification systems that create and contextualize meaning for societies, groups, and individuals). From 1963 to 1966, Joanne lived in Africa, where she was a research associate at the University of Nigeria, Nsukka. While studying the importance of dress and textiles to the Nigerian people, she began collecting African textiles. As Joanne wrote in her paper "Reflecting on Collecting: My Romance with African Textiles," she wrote, "I visited markets, asked questions, watched weavers and dyers, and collected and collected. By the end of my stay, my purchases had grown far beyond any immediate use." Joanne's fabric collection eventually surpassed 500 pieces―collected during eight African trips over the course of 11 years. In 2012 she began giving pieces away to museums and special collections. All photos of textiles in this story were taken by Kate Leibfried and are used here with permission. You can view more of Kate's textile photography at the Eicher African Textile Collection. ... you were talking about people rolling up jeans to show the selvedge. There's a good example of this in terms of my African prints. One company that made these prints was called Vlisco. On the selvedge of their prints, they would have the words "veritable wax." So it's very much like the jeans, whether the selvedge is hidden inside the coin pocket or turned up at the hem. 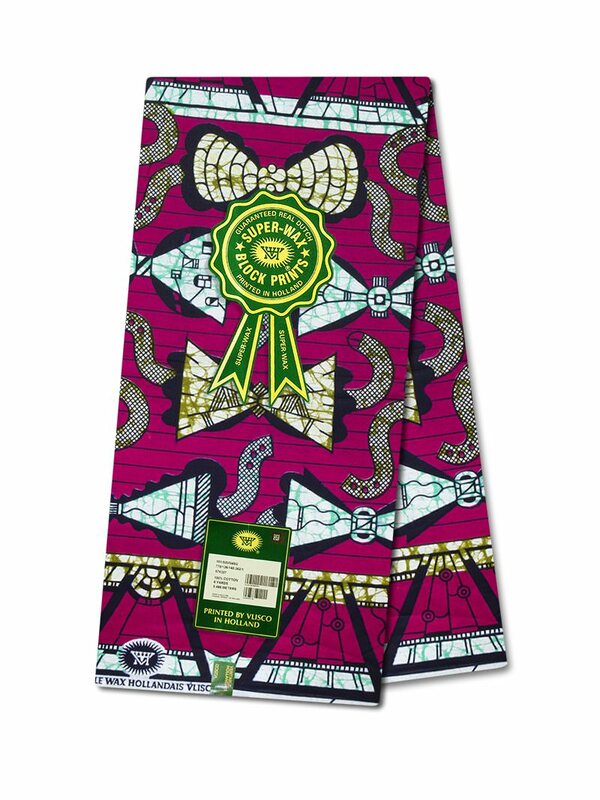 When I was in Africa from '63 to '66, we would see ... as a matter of fact I hadn’t made this connection until right now ... we would see people wearing Vlisco textiles, and they would leave the selvedge showing so that you could see the words "vertiable wax." We thought it was kind of gauche, that you were supposed to hide it, turn it under or something, because the emphasis is supposed to be on the print itself. So, exposed selvedge is a signifier, whether I'm turning up the hem of my selvedge jeans or someone in Africa is showing the selvedge on their wrapper. I'm just not sure what it is that we're signifying. It's all about being in the know, and sometimes the smaller the group, the more elite it becomes. In high school it can be the tiniest difference that people recognize as being very fashionable. You're either in or out. You violate the norms sometimes, and high school kids can really be quite mean. If they're mean enough, they're bullies. Otherwise it can just be some nasty comment. Until you really get it, you're just out. There had been some trouble on the way back to Mrs. Theiss' classroom following our morning milk-break in the cafeteria. My sixth-grade classmates and I stood without moving in a single-file line that curled around the main stairwell inside Shade Elementary. Mrs. Theiss had ordered us to freeze when she spotted a couple of boys engaging in shenanigans up on the second floor. While Mrs. Theiss sorted out the infractions, I milled around in front of the bottom flight of stairs, inside a little cubby of space. To my right was Mrs. Bilski's music room. To my left, the boy's bathroom. Directly behind me was the basketball gym, home of the Shade Panthers. A few male classmates formed a huddle near me and started whispering among themselves. I stood around on my own, slightly bored, not expecting my life to change. The whispering in the huddle stopped, but I didn't notice. I did notice, however, the single, raised voice that replaced it. "Hey, you wore those same clothes yesterday!" The boy's voice was jubilant. It jingled like keys on a janitor's hip. I turned to see that the huddle had broken up, and one of the boys now stepped towards me. He stretched his arm out in the air between us, one rigid forefinger indicating the direction in which his friends should cast their laughter like stones. They hit my t-shirt, which given the time period quite likely featured several G.I. Joe characters piled onto a skimobile that was equipped, however improbably, with laser canons. They hit my K-Mart jeans. And living as we were in the first generations of Air Jordans and Air Force 1s, they definitely hit my Stadia sneakers. My socks and underwear were always clean. Otherwise, I typically wore the same t-shirt, jeans, and sneakers until they were dirty or, in the case of the Stadias, my toes poked through. But I had no idea that such repetition was a violation of the norm. Hell, I hadn't even know that there was a norm, not until that exact moment. As the laughs landed, one thought crystallized in my young mind: What you wear (and how often you wear it) matters. Clothing immediately preoccupied me. Every day I studied my classmates, building a mental chronicle of who wore what when. I judged myself accordingly. Some people can play music by ear. Joanne's mother could sew by sight. "She could see something and sew it," Joanne remembers. Even with very technical things like attaching a sleeve to the armscye, or armhole space, Joanne says her mother "somehow just knew it." Joanne grew up wearing clothes that her mother made, and this continued even into Joanne's college years. "That was the period of time when formals were really popular," Joanne says. "So, the J Hop, the senior dance, military balls―my mother made most of those dresses for me." With textiles running in her blood, Joanne minored in Textiles, Clothing, and Related Arts. Her mother had mastered the What of clothing, and Joanne began to explore the Why of textiles after receiving her doctorate. In 1963, Joanne moved to Nigeria, where she saw textiles informing how Nigerians danced, mourned, created different gender-based aesthetics, and otherwise built and expressed ethnic and individual identities―to the extent that fabric helped Nigerians authenticate their culture. Later focusing on the Kalabari people, Joanne witnessed a unique relationship between people and cloth. The Kalabari (1) acquired madras cloth from India, (2) characterized the cloth by giving it a new name, (3) incorporated the fabric into their ceremonies, rituals, and daily lives in meaningful ways, and (4) transformed the fabric, specifically via pelete bite, a painstaking method of design-by-subtraction in which Kalabari women remove the threads of madras fabric with a needle and knife or razor blade. This technique creates new designs in the madras, thereby transforming an Indian fabric into something uniquely Kalabari, a four-step process described as "cultural authentication.” Throughout Joanne's career she investigated other instances of cultural authentication, such as Seminole Native Americans creating their own style of shirts based on those worn by European settlers. The scope of Joanne's research on African textiles gave her a fresh vantage point for dress in general. She would go on to write about the concept of "elegance" in African-American dress. She wrote about Marilyn Monroe's covert feminism in a paper titled "Dumb Like a Fox." She wrote about Hmong Americans and how they strengthened generational bonds through dress. All the while, she never stopped writing about the Kalabari and their cloth. However, while Joanne spent decades getting papers published and books printed, university-level Home Economics departments continued to treat clothing as clothing, with a focus on construction. In the 1973 first edition of "The Visible Self," Joanne and Mary Ellen Roach-Higgins expanded the concept of dress beyond clothing, to view the topic, as the authors said, "cross-culturally and objectively." Then, with the second edition of the textbook, published in 2000, the authors went even further. Whereas previously they had expanded the definition of dress, they now changed it altogether. With the classification system that you introduced in the second edition of "The Visible Self," did you redefine what dress is? Yes, among our younger colleagues, we're definitely given credit for that. Our system is still referred to and cited a lot. People forgot that when you talk about getting dressed, you're talking about much more than putting clothes on. That's why our classification system for dress includes body modifications and body supplements. We were looking at the body in and of itself. We weren't just looking at clothing. Right, so supplements are things you add to the body, like clothes, and modifications are changes you make to the body, like tattoos and piercings, and even adding perfume or cologne. Even hair combing is a modification because you're doing something with the texture of your hair. Even showering and putting on body lotion, you're modifying your skin. In the past, men often said that this was all superficial, but they wore aftershave, and aftershave is a scent, like you mentioned. Women of course have makeup and their hair and now we even have magnetic eyelashes. You have all of these things that you can do to your body. Even plastic surgery, when done for cosmetic reasons, is part of the totality of dressing. After you got your doctorate from Michigan State, you taught in Boston and then went back to MSU in 1961 to teach in Home Economics. You were there for 16 years, and during that time, you were one of the faculty members who helped change the name of your department from Home Economics to something else. I wonder if that change had a larger meaning, whether it reflected changing American culture. At Michigan State I took a position in the Home Economics college. My department was Textiles, Clothing, and Related Arts. We later changed the name of the college to Human Ecology, and we changed the name of department to Human Environment and Design. At that time, college-level Home Economics was preparing women to teach clothing construction in high school. Well, I wasn't going to teach construction. That was never my training, So, I started teaching things like clothing and human behavior. Then my colleague Mary Ellen Roach-Higgins took a job similar to mine. What was happening across the country at that time―probably partially because of the work of (Gregory) Stone*, but also because of a woman at Penn State whose name was Ruth Ayers―was that colleges with Home Economics and Textiles and Clothing departments began to realize that there was more going on with clothing than just construction. The woman I replaced at Michigan State, Mary Lou Rosencranz, was either the first or one of the first people academically in any Textiles and Clothing department to study dress socio-culturally. Home Economics was part of the agricultural land-grant system. Homemaking and agriculture were side-by-side. The funding for Home Economics and agriculture were controlled by men, and men really thought that fashion was a very frivolous topic. One of my colleagues at a land-grant college was asked to take fashion out of the title of a course. Also, one guy that I was pretty close to had done his Ph.D. research on adolescent dress. He was embarrassed that he had focused on that topic. He didn't want to acknowledge it while applying for jobs. Had he acknowledged it, he probably would have had a great career. He wasn't particularly outstanding or well-known, whereas because I wasn't hampered by being embarrassed, it worked out for me. This isn’t blaming men or anything. It's just looking at the facts of how things developed and what was considered appropriate. Fashion was just something that was on the women's pages, the fashion supplements. It was just women's concerns. Speaking of the role of men, you received your Ph.D. in 1959, along with an estimated 1,030 women, compared to 8,800 men. (These stats are via Statista. ―JJ) Every year since 2005, more women than men have received doctorates, but that wasn't the case when you graduated. In 1965, the University of Minnesota started naming Regents Professors. You became the fourth woman to receive that honor, in 2005. So, that's four women in 30 years. You've belonged to academic clubs that are male-dominated, and you mentioned to me previously that one club was pretty rowdy in its masculinity. It would be very easy for someone to look at your career and see you as a feminist icon, and I wonder if you see yourself that way. What can I say? I enjoyed what I was doing, so I just kept going. I was asked once after I became Regents Professor to carry the Mace. ("The Mace" is part of the University of Minnesota's commencement regalia, described by the university as "a staff borne by, carried before, or placed near a dignitary as an insignia of dignity and authority. ―JJ) I don't know if I was the first woman to carry it, but somebody asked me how it felt to be the one carrying the Mace. I just said, “Well, you know, one foot ahead of the other.” I guess that's it. I am a great feminist, but I haven't been like Gloria Steinem. I've been doing my own thing in my own way. You've written about dress as it relates to Kalabari funeral rites. You've written about the importance of dress in terms of social acceptance among adolescents. You've written about the relationship between Parisian couture and the clothing of Minnesotan women. You and I have talked about exposed selvedge, both in terms of African wrappers and American blue jeans. Is there a through line with all of these topics from your career? Is there something that we all have in common, whether we're Minnesotan women or Kalabari? Yes, I think it's really clear. I think it's an identity system. It’s the communication of who we are. That may sound too simple, but it's so simple that it is complicated. The complicated part is that it depends on where you are and who knows you, and how much you know about the specific communication system relevant to where you are. If you're not part of the system, you won’t be able to understand nuances. There are a lot of nuances with dress. Some of them are cultural. Some of them are individual. People like to generalize and say, “Americans look like this or look like that.” You could make that generalization about a nation of people or sorority women or fraternity men. But people who really understand the group that's being singled out can see differences among people in the group in terms of how they dress. You almost have to be part of that group to understand the distinctions. That's why I think the study of dress and fashion is more complicated than people sometimes want to believe. People might want to think that fashion is frivolous, but that attitude has almost been worn out now.